Betrayals and Besiege! Nestled between the shores of Loch Assynt and the looming peaks of the Quinag, Ardvreck Castle (Caisteal Àrd Bhric in Gaelic) in the Scottish Highlands was once home to the MacLeods of Assynt. It is an achingly beautiful part of Scotland with mountain faces of sheer rock and bleak moorland interspaced with lochs. There is an other-worldly feel about this land. Only the hardiest of people could dwell here and the MacLeod chiefs chose the spot well as it was easily defendable. 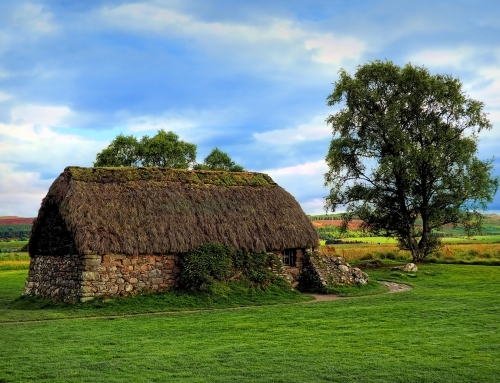 However, the MacLeods of Assynt were to play a role in the dark history of Scotland’s Reformation and, what was seen as a betrayal of highland hospitality, gave the MacKenzies of Wester Ross the excuse they yearned for, to besiege the castle. But when the MacKenzies took residence within the castle, they discovered that the MacLeods had not all left, for a couple of ghostly presences remained behind to haunt its halls. Ardverk was hit by lightning in 1795 and all that remains is a finger-like structure pointing accusingly into the sky. 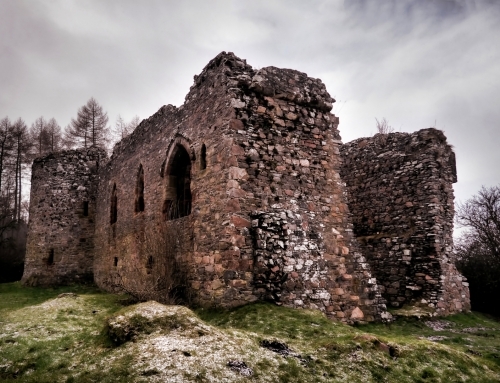 Myths and legends cling to this enigmatic ruin making it one of Scotland’s most haunted buildings. The lands of Assynt were granted to Torquil MacLeod of Lewis during the reign of David II although his ancestors had traditionally held the area from the mid -thirteenth century. His second son, Norman, was given Assynt as his portion. The castle was built in two phases with a simple rectangular hall block built by by Angus Mor III in the late fourteenth or early fifteenth century. This was four storeys high with the upper floors of timber. However, during the sixteenth century, Donald Ban IX added a stair tower. It is said that during the castle’s construction, the laird entered into a pact with the devil. The devil offered to help the Laird in exchange for his soul. The Laird, being a canny Scot, was not about to pass up the opportunity for free labour and besides, he dearly yearned immortality. Negotiations were at an impasse when the Laird’s daughter, Eimhir, appeared on the scene. The devil was smitten by her beauty and seized his opportunity. He agreed to build the castle on condition that he could marry the daughter. The deal was secured, the castle built, and the wedding took place. Alas, it was at a time when women of gentle birth, were pawns in marriage deals and arranged weddings. The poor lass had no idea who she was being wed until after the marriage ceremony. To her horror, she discovered her husband’s true identity and flung herself out of a tower window into the loch below where she drowned. Now it is said that she wanders the ruins, weeping. The story has an alternative ending. Whispered amongst the locals are tales that instead of jumping to her death, Eimhir plunged into the caverns of the Loch and, hiding from the devil to whom she was wed, made a new home beneath the water’s surface, becoming the elusive ‘mermaid of Assynt’. It is said that when the loch’s water rise above their normal levels, it is caused by Eimhir’s tears mourning for her life lost on the land. Some claim to have sighted her weeping on the rocks, her body now transformed into half woman, half sea creature. Other say that she is a Selkie, who must first shed tears into the water in order to become visible again to the human eye. 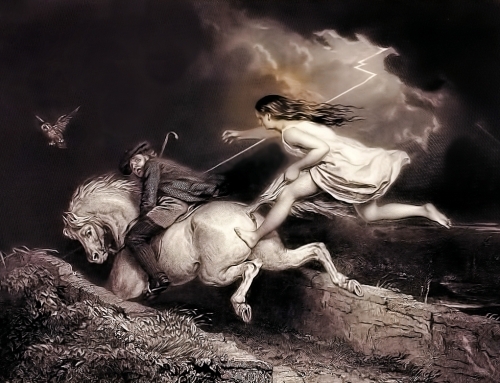 According to the legend, the devil, infuriated by the broken promise of marriage summoned meteoric rocks from Chaos to obliterate Inchnadamph and MacLeod’s kingdom. These legends have also been used to explain the unique geological and topographical character of Inchnadamph. Another version of the tale of the mermaid of Assynt relates to the creation of the Moine Thrust belt. Some believe the devil’s rage produced a tectonic rumbling from the earth’s core, resulting in what is known as the Moine Thrust Belt today. 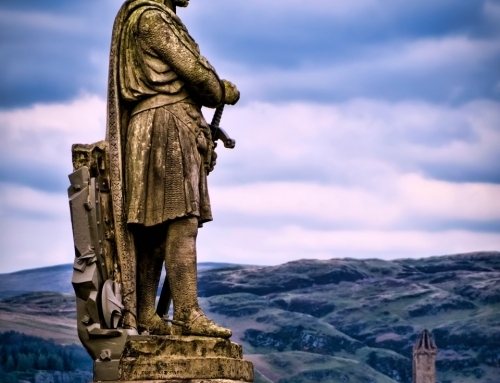 Advreck Castle entered Scotland’s history books for its role in the dark and bloody War of Three Kingdoms. In 1650, when James Graham, the Marquess of Montrose, fled to the castle after his defeat at the Battle of Carbisdale, against the Covenanters. Montrose had come to the Scottish Highlands, seeking support for the Royalist cause. After his defeat he sought sanctuary at Ardvreck Castle on the 30th April. Here the sequence of events has become shrouded in the mists of time. One account states that while the Laird, Neil MacLeod, was away, his wife Christine allowed the Marquess admittance, then tricked him into entering the dungeons. Locking him in, she sent word to the Covenanters. Another version states that Neil MacLeod was indeed in residence. He offered the fugitive shelter, then treacherously sent word to General Leslie, head of the Covenanter Army. Either way, this was seen a notorious betrayal of Highland hospitality. Montrose was taken to Edinburgh and subsequently sentenced to death. A tall man dressed in grey is said to haunt the castle and appears standing within the tower staring blankly at the ground. He is said in some way to be related to the betrayal of Montrose and some say that he is Montrose himself. The tide turned in favour of the Royalists’ cause and Charles II returned to the throne. The MacKenzies, who had long envied the MacLeod stronghold at Assynt seized the opportunity. Using Montrose’s betrayal as an excuse they staged a fourteen day seize on the castle in 1672. The hapless MacLeods were defeated and the MacKenzies became the new owners of the Castle. However, when Kenneth MacKenzie brought his new Frances, to Ardvreck, she found the castle cheerless and uncomfortable. In 1726 MacKenzie began building the more modern Calda House within sight of the castle. Frances’ extravagant lifestyle, plunged the family into debt and they were forced to sell their home to their bitter enemy, the Earl of Sutherland. The Local MacKenzie retainers, determined that no Sutherland would live in Assynt, set fire to the house in 1737 although another version of events states that the MacKenzies were holding a banquet on a Saturday evening. The celebrations continued past midnight into the Sunday when fire broke out. It was said to be divine retribution for making merry on the Sabbath. The sole survivor was a piper who refused to play past midnight, but ever since that fateful night the house has said to be haunted by ghosts. Strange lights have also been seen around Calda House at night, and several people have claimed that they have seen car headlights approach them on the road in the darkness, but after waiting for the vehicle to pass, no car has appeared. Today the impressive ruins of Calda House face the equally impressive ruins of Advreck Castle across the curving sweep of Loch Assynt. 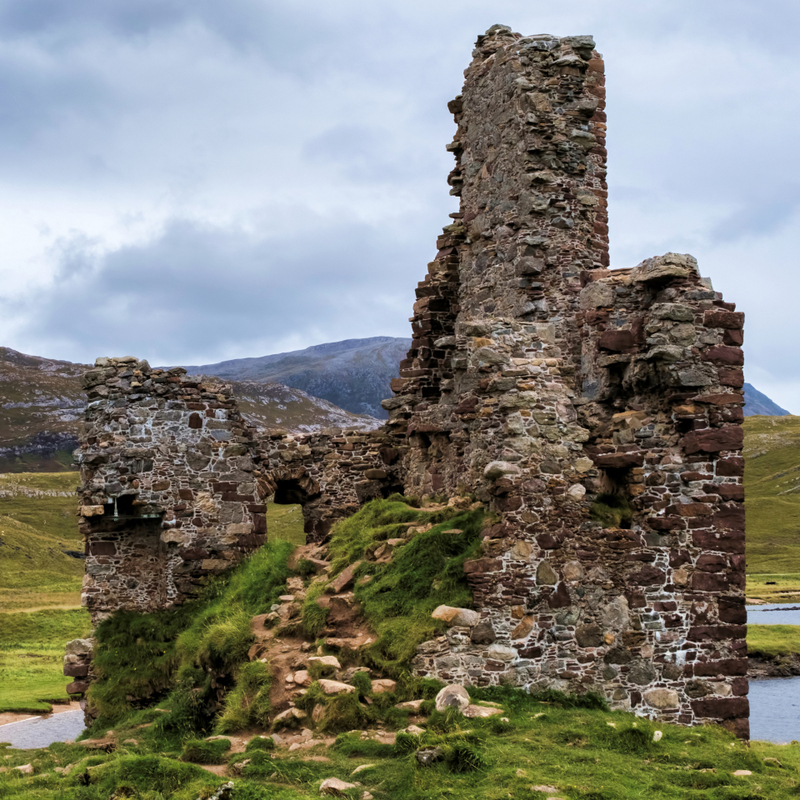 However, according to legend, during the eighteen century, the tower-house was tenanted by a terrible old woman known as the Wicked Lady of Ardvreck. This woman had stirred up trouble between a neighbouring couple, spreading gossip about the wife and saying her child was fathered by another man. The husband in his rage threatened to kill the baby. His wife, in despair, called upon her two brothers, who tracked the rumours to their source and confronted the Wicked Lady. The old woman appeared willing to answer their questions, co-operating when the younger brother proposed putting her accusations to the proof. Suddenly, he began to write with his finger on the stone floor of the great hall, muttering in an unknown language. As he was doing this, the water of Loch Assynt began to heave, and thick mist arose from its surface and spread over the sky. A tall, black, shadowy figure appeared, standing beside the wall, and the younger brother told the husband to question it – but quickly! Anxiously, the husband asked if his wife had been unfaithful and the shadow replied that she had. As it spoke a huge wave arose from the loch and dashed against the tower walls, breaking the hall windows, while a tempest lashed the roof and turrets, and the floor seemed to rise and fall like a ship in a storm. The younger brother turned to the Wicked Lady and declared that the spirit would not depart without a gift. The old woman tried to offer up an orphan girl who worked as a serving girl in her household. Another huge wave came crashing in, half filling the hall, and the whole castle seemed on the point of collapse. “Then take the old witch herself!” screamed the eldest brother. Even as it spoke, it vanished. When the men got home, they were told of the death of the baby at the very moment the shadow disappeared. Some while after that, the castle of Ardvreck was consumed by a fire and the Wicked Lady perished in the flames. 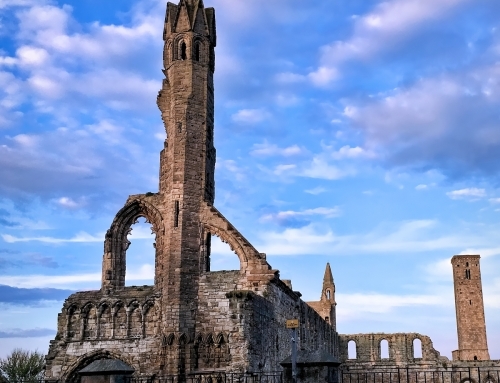 Whether or not you encounter any apparitions, this place is guaranteed to give you goose-bumps for the sheer mystic beauty of the ruins set against the hulking mountains of the Scottish Highlands.